The bottom part of this illustration shows the scale of the universe versus time. Specific events are shown such as the formation of neutral Hydrogen at 380 000 years after the big bang. Prior to this time, the constant interaction between matter (electrons) and light (photons) made the universe opaque. After this time, the photons we now call the CMB started streaming freely. 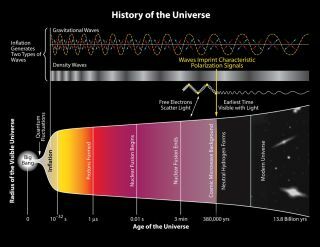 The discovery that the universe really did expand at many times the speed of light immediately after the Big Bang should bring physicists slightly closer to their ultimate goal — the long-sought "Theory of Everything." On Monday (March 17), researchers announced that they had detected the signature of gravitational waves in the cosmic microwave background, the ancient light that began pervading the universe 380,000 years after the Big Bang. The discovery also gives researchers a new window onto a realm of extreme physics, potentially aiding their daunting quest to devise a theoretical framework that can explain all aspects of the universe. "This will give additional motivation, and also additional constraints, on models of inflation and, perhaps, a Theory of Everything," Harvard theorist Avi Loeb, who was not a member of the study team, told Space.com. "But, of course, it will take time." Physicists rely on two different theories to explain the universe: Einstein's general relativity, which applies to the realm of large objects such as stars and galaxies, and quantum mechanics, which works well at the subatomic level. Together, the two frameworks cover the four fundamental forces in the universe; general relativity deals with gravity, while quantum mechanics focuses on the weak force, the strong force and electromagnetism. But the two theories are inherently incompatible, breaking down in extreme realms such as those found inside black holes or in the instants just after the Big Bang. So physicists long for a single framework that marries all four fundamental forces and works at all levels and in all situations. One of the leading contenders for such a Theory of Everything is string theory, which holds that all of the fundamental particles in the universe are actually vibrating, one-dimensional objects. The new gravitational wave discovery should help refine that idea, Loeb said. "Now these models are ruled out, and they [string theorists] have to go back to the drawing board and make new models that are compatible with the data," Loeb said. The energy levels present during inflation were likely on the order of 10^16 billion electron volts, or roughly 1 trillion times greater than those achieved by Earth's most powerful particle accelerator, the Large Hadron Collider. At such energies, the strong, weak and electromagnetic forces probably all blended together, researchers say. "This discovery probes new physics, and that's why it's of such fundamental importance, to physics as well as cosmology," Loeb said. "Since we can't really do the experiments in the laboratory, we better rely on the universe to give us some clues about what happens at these energy scales." Primordial gravitational waves give scientists a way to peer further back in time than they ever have before — to around just a trillionth of a trillionth of a trillionth of a second after the Big Bang. While the new discovery likely marks a watershed moment in our understanding of the universe, physicists working on a Theory of Everything would love to look back further still — to the earliest of all times, the "Planck epoch," in which all four fundamental forces are thought to have been unified. Scientists are piecing together an increasingly accurate picture of the universe and its history, but there is still much left to be learned. For example, Loeb said, researchers have no idea what the substance that propelled inflation — known as the "inflaton" — actually is. They also lack basic information about mysterious dark matter and dark energy, which together make up 96 percent of the universe. "It looks like we are at a relatively primitive early stage in cosmology, where we find the constituents that are necessary to explain the data that we have about the universe, but we don't really know what they are," Loeb said. "There are some islands of knowledge, but they are surrounded by an ocean of ignorance." Still, he said, a Theory of Everything may eventually emerge — as long as scientists continue making landmark observations that can guide the theorists' thinking. "I think it's possible, as long as we have experimental clues like this one, for example," Loeb said, referring to the detection of primordial gravitational waves. "If we get enough constraints, then they can guide us in the right direction," he added. "But just thinking about it abstractly, like was done over the past few decades, just from pure thought — I think there are too many mathematical possibilities for us to figure out which one describes reality."